Debra: A beautiful, famous skater has just told you how much she loves your work. How can it be better than that? Ray: I could be single. Though it is currently one of the highest rated series on television, has won numerous awards, and boasts a veritable all-star team of comedians, the allure of Everybody Loves Raymond somehow eludes me. This is not to say that I am not a fan, because I often find the humor to be to my liking, but truthfully, Raymond is far from being the equivalent of a Seinfeld-type sitcom that is both smart and witty—in the end, Raymond isn't even a little of either. 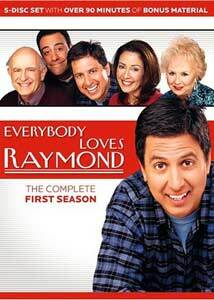 Created during the boom that gave stand-up comedians a shot at stardom by way of their own series, Everybody Loves Raymond offered the very funny Ray Romano (a stand-up performance is offered as a bonus feature) and places him in a situation familiar to any sitcom viewer. There are kids, a stubborn wife, eccentric family, and of course obnoxious friends and ultimately, in each episode, one of the group creates a situation that places Ray in trouble in one form or another, and shows how he will of course get out of it. The debut episode introduces us to Ray Barone (Romano) and his wife Debra (Heaton), who are living an ideal life on Long Island with a three-year-old daughter (Sweeten) and two young twins. Life is perfect, except for Ray's parents, Frank (Boyle) and Marie (Roberts), who live directly across the street and are always in their lives. From opening bills to snooping in drawers, they are nightmare parents to be sure, but aside from the performances, neither is really a standout character. The comical centerpiece of the series is Ray's brother Robert (Garrett), a 30-year-old police officer who still lives at home with his parents and resents everything that Ray has accomplished. During the course of the first season, the series grows but it never expands beyond the trappings of a conventional sitcom. Ray a lesser version of Tim Taylor or even Homer Simpson, while Debra, Frank, and Marie seem more like a wall to bounce punchlines off. Only Garrett delivers his lines with a timing and bite that leave the viewer wanting much more. Everybody Loves Raymond offers sort of the ideal sitcom family and that may well be what makes it work despite its flaws. It had been a long time since we had been afforded a family that resembles those seen in the early days of television. With the inclusion of the perfect couple and their adorable children as well as a wacky supporting cast of characters, the show clearly makes no bones about its intentions, and even offers a lesson in every episode to boot. In the first season we are shown that it is acceptable to show affection in public, that you can always ask your father for help, that no one person is better than another, and that just being yourself is the best way to impress people. To be truthful, the show never really explores anything challenging. In fact, nearly every staple present in the sitcom guidebook is offered up including a discussion about honesty in The Game, Christmastime feelings in The Ball, and Ray taking full control of the kids while Debra battles the flu in Debra's Sick. I suppose my issue with the series stems from its enormous popularity, and that the show continues to chug on year after year while amazingly funny sitcoms including Scrubs and Arrested Development hinge on the chopping block fall after fall. I suppose the truth is, I really just sort of like Raymond. Didn't think I was going to let that one get away, did you? Image Transfer Review: Each episode is presented in the same full-frame aspect ratio as originally broadcast, and while it is safe to say that this is the best this series has ever looked, the transfers could certainly be better. Colors are done nicely with only a small amount of bleeding evident, but the transfer suffers from a dark hue that plagues nearly every episode. I do not remember the shows being dimly lit when they first appeared on the air, but they do seem so on this first season set. There are no noticeable traces of edge enhancement and sharpness and detail are done admirably. Audio Transfer Review: The Dolby Surround track offered is largely a dialogue-heavy mix that offers very little beyond the center channel. Dialogue is crisp and clear with only a few instances where the mix sounded muffled, while the surround speakers do a fine job of reinforcing the laugh track featured on the series. Extras Review: While not exploding with extra features, Everybody Loves Raymond does offer some fun and interesting bonus material, including two optional commentary tracks with Ray Romano and series creator Phil Rosenthal. Both the pilot episode as well as the first season finale, Why Are We Here. Both tracks are entertaining as Romano cracks a few jokes and tells of his experiences making the series. A behind-the-scenes featurette shows the making of the series and includes interviews with cast and crew as well as a look at the origins of the series. More or less this is simply a rehash of what can be learned on the commentary track but it is worth a look. The best extra feature is the nearly five-minute stand up routine by Ray Romano on The Late Show with David Letterman that led to the eventual idea for the series. Romano is a funny and gifted stand-up comedian, but many of the jokes are used in the first season so much of it may seem redundant. Everybody Loves Raymond is housed in a nice case and offers some nice special features with a reasonable price tag, so fans of the series should definitely pick this one up.